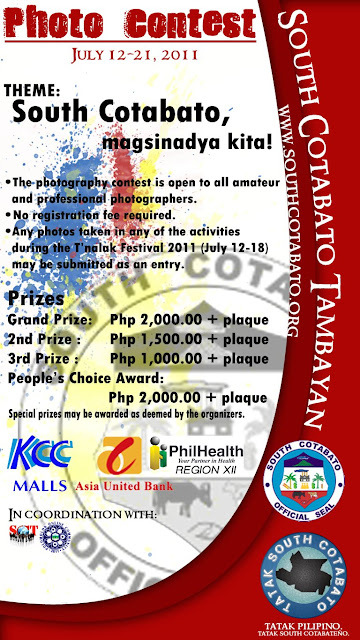 Join the 1st South Cotabato Tambayan Photography Contest! Check out the poster and the guidelines below. The photography contest is open to all amateur and professional photographers. Photos must be taken by the entrant and must not infringe on the rights of any third party. Any photos taken in any of the activities during the T’nalak Festival 2011 (July 12-18) may be submitted as an entry. Entrants are allowed to submit a title together with their photo, not exceeding ten (10) words. Failure to comply is reason for disqualification. Only 3 entries per entrant is allowed. The organizers reserve the right to disqualify any entry that does not meet the above requirements and the right to amend mechanics at their full discretion. Judging of Contest will be decided upon by the organizers. There will be an online voting using Facebook “Likes” and rating buttons via www.southcotabato.org to decide the PEOPLE'S CHOICE AWARD. Judges decision shall be final. The theme shall be "South Cotabato, magsinadya kita!" in line with the T'nalak Festival celebration. The contest shall accept entries until July 23, 2011 5pm. All notable entries shall be given acknowledgement over the South Cotabato Tambayan and South Cotabato News Online websites . The 1st South Cotabato Tambayan Photography Contest is made possible by the support of our sponsors: KCC MALLS, ASIA UNITED BANK , PHILHEALTH XII and the PROVINCIAL GOVERNMENT OF SOUTH COTABATO through the office of HON. GOV. ARTHUR "Dodo" Y. PINGOY, JR., M.D.